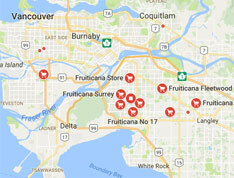 Fruiticana is committed to ensuring the highest quality of the products carried in each store. As such, in 1997, Fruiticana established the Indican brand, delivering premium quality spices, lentils, and juices from India. Regardless of where the product is sourced, we attempt to deal directly with growers, packers and manufacturers. We have taken number of steps to ensure that only the freshest and pure quality products are available to our customers. For example, Fruiticana has established its own procuring and packing facilities in India. Tony Singh, President and Founder of Fruiticana, takes personal interest and pride in ensuring products meet or exceed quality standards. He frequently travels to meet suppliers to check products and discuss improvements in the supply chain. He can often be found in Fruiticana’s 125,000 sq. ft. warehouse facility checking on items that are arriving daily from all over the world. "Customers want to know what they are feeding their families and be confident that the item is of the highest quality. I would like our customers to know we go to incredible lengths to ensure we exceed their expectations." says Tony Singh.